Filling in the annual textbook ordering form, joining the queue to collect the textbooks and school supplies, and having to lug the box of textbooks home… Sounds familiar? Well it’s time to bid goodbye to all this hassle! Take advantage of the annual ordering online fulfilment provided by GoGuru, the official e-store of the Times Publishing Group, and have your textbooks and school supplies delivered right to your doorstep. Now, you can shop the whole range of Marshall Cavendish Education (MCE) textbooks and assessment books – for both primary and secondary levels – in just a few simple clicks! #1 It’s easy as 1..2..3! No maths knowledge required, ordering is fuss-free in 3 quick steps – simply select your child’s school level and education type, the products, and check out! The only difficult decision you will need to make is which credit card to use for the best rebate. 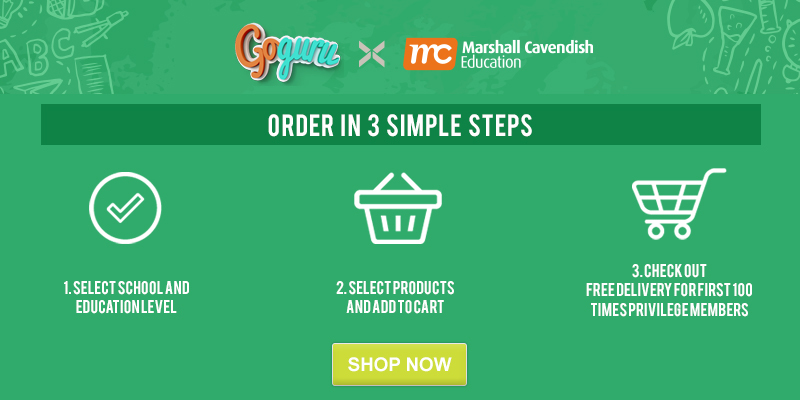 GoGuru carries the full range of Marshall Cavendish Education textbooks and assessment books, including ‘My Pals Are Here!’, ‘Maths 360’, ‘Discover Science’. All you have to do is select your child’s school and we will show you the MCE textbooks required by their school. Hands up if you are here for big savings! Unlock additional discounts when you order the MCE textbooks online, we have got up to 70% off school supplies like backpacks, water bottles, and more lined up for you. Let us do the heavy lifting – order the textbooks online and have it conveniently delivered right to your door step. The best bit? The first 100 Times Privilege members who order the MCE textbooks via GoGuru get to enjoy FREE DELIVERY! Sign up as a Times Privilege member (PS: membership is FREE!) and receive a 20% off voucher that can be used for your next purchase at both GoGuru and Times Bookstores! After all the hard work, we think your child deserves a treat with the latest from the Geronimo Stilton or Sherlock Sam series, don’t you too? Start your smart textbook ordering here.